Beton Tecnica of Italy has produced work for eight prime contractors on several projects in Italy and Cyprus over the past several years. 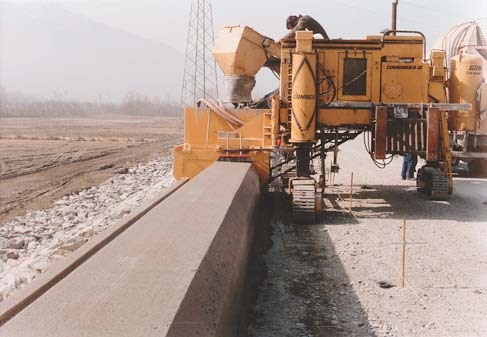 As the subcontractor of these projects, Beton Tecnica was using a GOMACO Commander III machine. 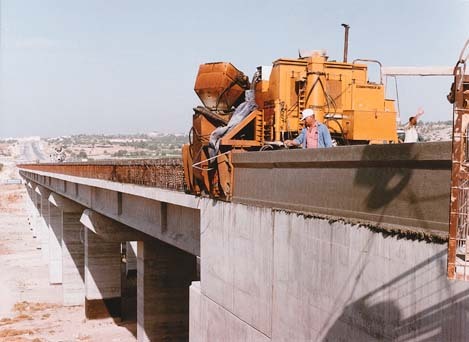 They were responsible for all slipformed curb and gutter, paving, bridgework and a safety barrier wall. The versatility and diversification of the Commander III was essential to the success of the projects. Carlo Zuglian began his career as a service manager with a company in the construction industry. He traveled around the world gaining experience on the equipment side of the business. In 1987 he had his first experience with GOMACO equipment while working for a construction company in Africa. Shortly after he started his own company, Beton Tecnica, in Pedavena, Provincia Belluno, in northern Italy, he acquired three GOMACO machines, two Commander III's and one HW-165. Tony Di Pietro, GOMACO International Ltd. District Manager, Middle East and Mediterranean area, stated, "Those machines were sold by Vimatek, S.R.L., our Italian distributor, and were originally used in another country. 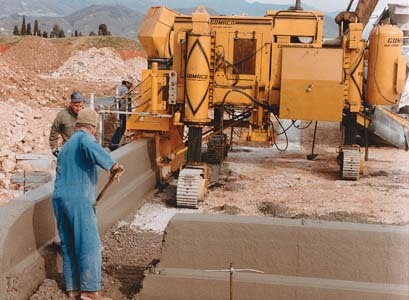 The machines were then re-imported into Italy and Beton Tecnica purchased them." Beton Tecnica has worked on several projects within Italy and Cyprus, and today Zuglian performs all of his own maintenance and modifications to the equipment. Zuglian found three projects to be the most challenging. One was in Cyprus for the Johannes & Paskevaidis, Ltd., Company of Nicosia, Cyprus. 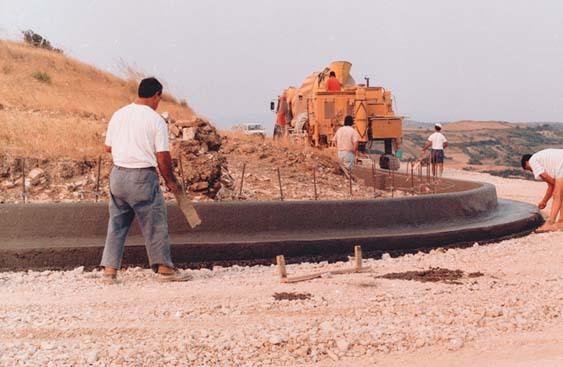 This required slipforming a parapet wall for a viaduct along a motorway from Limassol to Paphos, which is in the southwest portion of the island near Mount Olympus. Zuglian remarked, "The project was a big challenge. The wall consisted of a heavy rebar cage that was installed and sandblasted prior to slipforming." The wall was 1092mm (43 in) high and 9500m (31,168 ft) in total length. A five person crew poured the concrete containing an admixture to increase its workability. The average production rate was 40m (131 ft) per hour. The second most challenging project for Beton Tecnica was on the Autostrada A32 Expressway, between Bardonecchia and Torino in northwest Italy. It involved slipforming two types of barrier for the Recchi S.p.a. Company of Torino. One type was called a high median curb that was a safety barrier down the center of the expressway. This curb was 6km (3.73 mi) in length, and was 1.6m (5.25 ft) wide and 800mm (31.5 in) in height. The newly constructed curb had two rows of vertical supports for the steel safety barrier. There were three horizontal conduit pipes that ran through the center of the rebar cage. The supports, pipe and cage were to be put in place before slipforming the curbs. The second type was also a high curb with a gutter, which was actually a concrete drainage channel. This structure formed the outside barriers of the expressway and was 12km (7.46 mi) in length, 1.6m (5.25 ft) wide and 800mm (31.5 inches) in height. This curb included one row of vertical supports for the steel safety barrier and two horizontal conduit pipes that ran through a rebar cage. The gutter was also slipformed over steel reinforcement. One conduit pipe was for the electric and the other was for the communication cables. Electricity was needed for the lighting of the expressway to improve visibility for driving conditions. The vertical supports were flanged at the top with a wood covering to prevent the concrete from filling the opening. 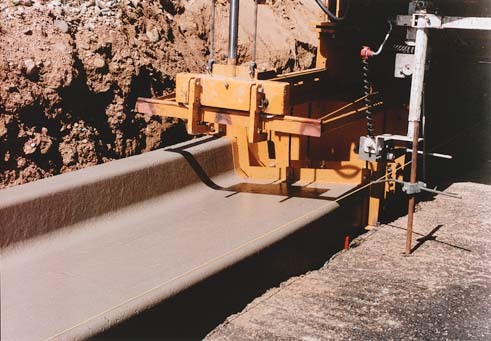 This slipforming required three people for the operation, and six to seven working behind the machine to open up the vertical supports on the surface while the concrete was still fresh. This allowed them to install the steel safety barriers. Also every 20m (66 ft) the crew had to extract electrical boxes from the concrete that were placed in the gutter line. These boxes would provide access for the installation and maintenance of the wiring. The production rate on these two projects was 250m (820 ft) per day in the beginning of the process. The maximum rate was 700m (2297 ft) per day. A normal day would have a production rate of 400m (1312 ft) per day. 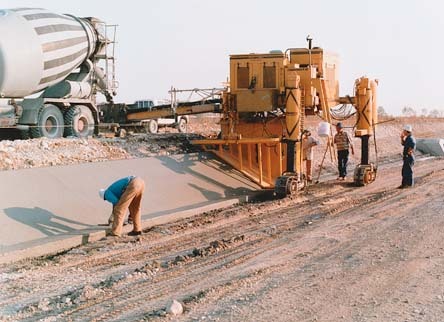 The concrete mix design was a 7-sack cement mix with up to 32mm (1.26 in) aggregate, and had an average slump of 50mm (1.97 in). Originally the job was estimated to take eight months, but was completed in under four months. Beton Tecnica did face several challenges during this project, however its success increased the demand of the company for future projects. 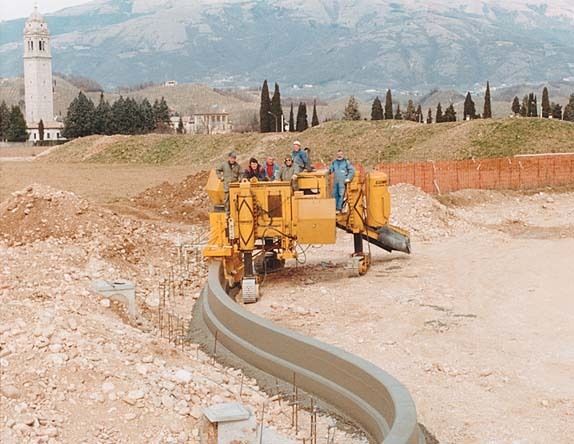 The Recchi S.p.a. Company of Torino contracted curb and gutter from Beton Tecnica in Ponti Áqui Terme, within the Provincia of Alessándria. 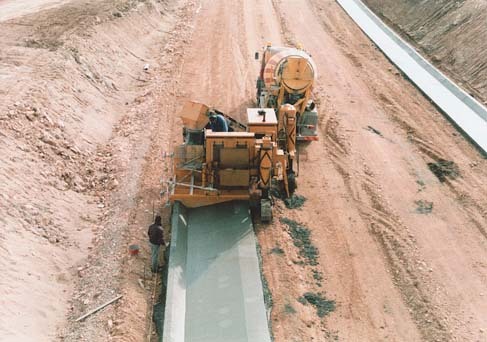 This curb and gutter was along a ring road on an interstate highway similar to an outer loop in a United States city. The curb and gutter was 4000m (13,123 ft) in length, 900mm (35.43 in) wide and 200mm (7.87 in) in height. 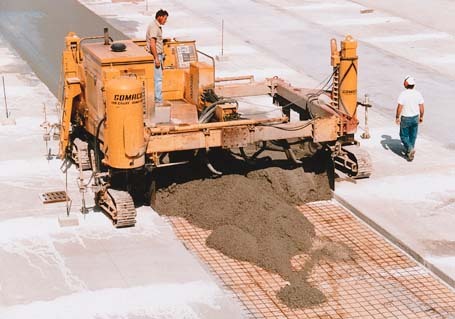 The concrete mix had up to 25mm (one inch) aggregate and an average slump of 60mm (2.36 in). This project had a crew size of only three persons. The production rate of this project averaged 500m (1640 ft) per day. The third most challenging project that Beton Tecnica handled was for the Gambogi Company of Pisa. 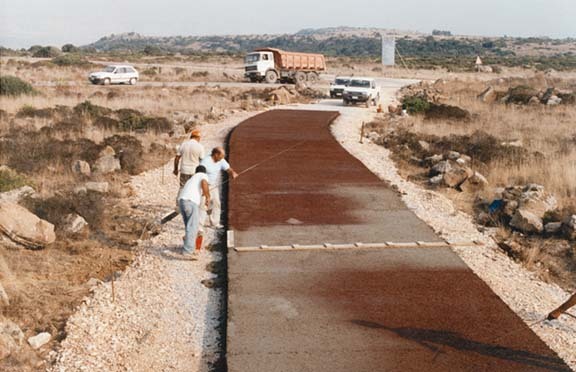 This project involved paving a road for a real estate development between two villages which are near a tourist area in Siddi, Oristano, on the island of Sardegna (Sardinia). The road needed a special treatment on the surface so that grass would grow on top. This would provide a natural look to the surface of the road rather than just bare concrete pavement. They also wanted to prevent any surface erosion that might occur. 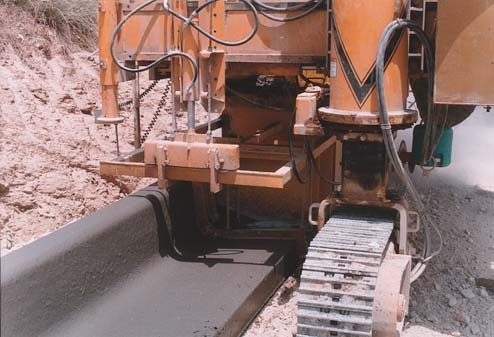 Zuglian developed the idea of trailing a special roller behind the machine to produce a transverse groove onto the concrete surface. The groove was 25mm (one inch) in depth. The road was 16km (9.94 mi) in length, 198mm (7.8 in) thick and 3.5m (11.48 ft) wide. The concrete had soil applied to the surface after it was dried, and was prepared for grass planting. 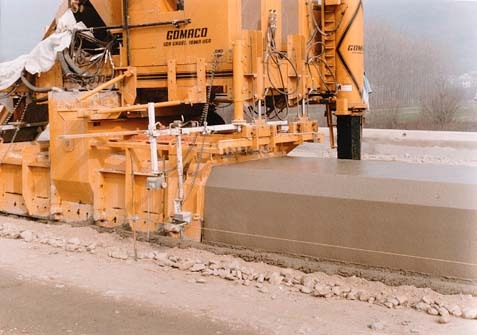 Beton Tecnica also slipformed 7.5km (4.66 mi) of curb and gutter in the area for the Gambogi Company of Pisa. The curb was 899mm (35.39 in) wide and 400mm (15.75 in) in height. The Commander III performed through radii with the tall vertical face of the curb. 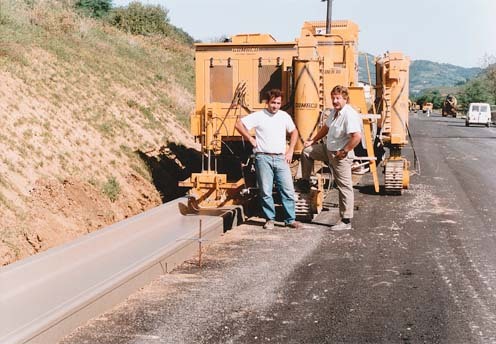 They provided slipforming on a road project for the Rizzani-De Eccher Company of Údine, which required pouring a drainage slope and a trapezoidal channel. The road was located from Cimpiello to Sequals, Provincia of Pordenone, and protected the area from flood waters. 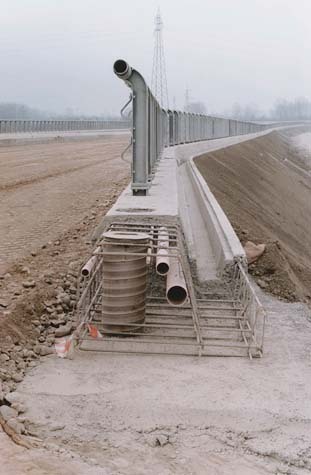 The drainage slope required concrete to be placed on wire mesh made of 8mm (.31 in) diameter steel bars. The paving length was 2500m (8202 ft) and the width of the slope was 2.84m (9.32 ft). The trapezoidal channel was 1.7m (5.58 ft) wide by 500mm (19.69 in) in depth. Four to five persons worked on the channel, with a production rate of 400m (1312 ft) per day. The Co. Ge. For. 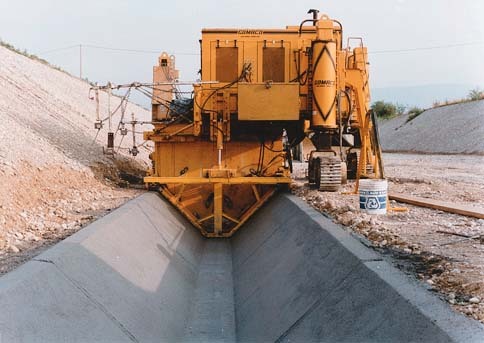 Company of Susegana, Treviso, subcontracted Beton Tecnica to provide services for a parapet near Vidor, Treviso. The real estate development required enclosing the residential lots of land, utilizing the concrete parapet as a flood barrier. The parapet was 300mm (11.81 in) wide on top, 1100mm (43.31 in) in height, and 3.2km (1.99 mi) in total length. They slipformed a radius of 6m (19.69 ft) with this parapet enclosure. 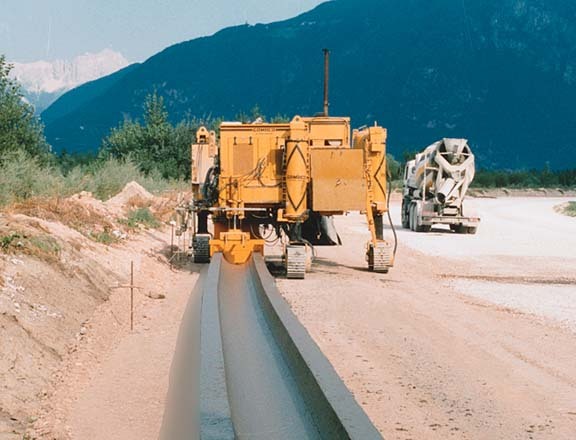 Adige Bitumi S.p.a. Company of Trento required Beton Tecnica to slipform a wide channel along the Brennero Autostrada A22 Expressway between Bolzano (Bozen) and Merano. 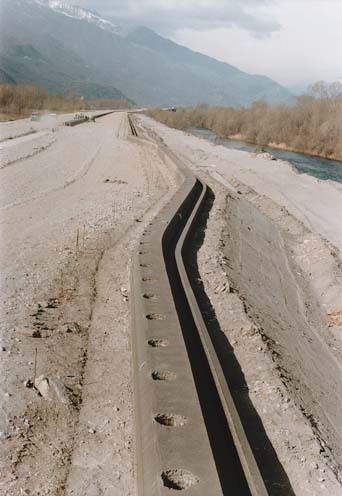 The channel was 800mm (31.5 in) wide and 7.3km (4.54 mi) in total length. The production rate was a maximum of 700m (2297 ft) per day. Donati S.p.a. Company of Rome subcontracted a drainage ditch along the main road from Mammoiada to Lanusei, Núoro. It was 2.54m (8.3 ft) in width and ran a total length of 14km (8.7 mi). The project was located in the mountains, which hindered the process of getting the material to the machine. The ready-mix trucks took as much as two hours to get from the plant to the job site. 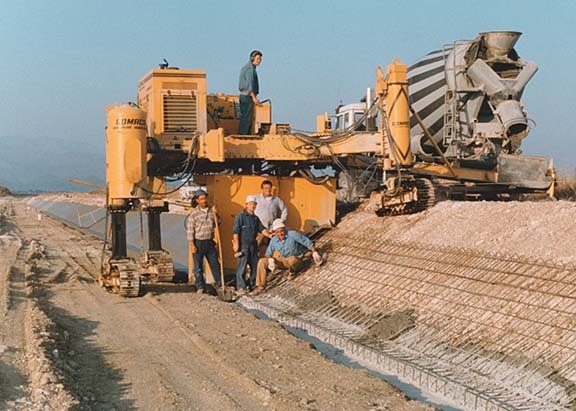 A crew of four persons poured the drainage ditch at a production rate of 350m (1148 ft) per day. A bus parking lot on the island of Sardegna (Sardinia) was subcontracted by the Andreoni S.p.a. Company of Cágliari, Núoro. This involved paving 12,000m2 (129,171 ft2) of land surface area for a public transportation group. Beton Tecnica had a five person crew for placing the wire mesh and concrete paving. The production rate was about 1000 to 1800m2 (10,764 to 19,376 ft2) per day. In closing, Carlo Zuglian stated, "GOMACO equipment is certainly the best equipment that I have worked with during my construction career." Seldom does one company take the Commander III and push it to the limit. 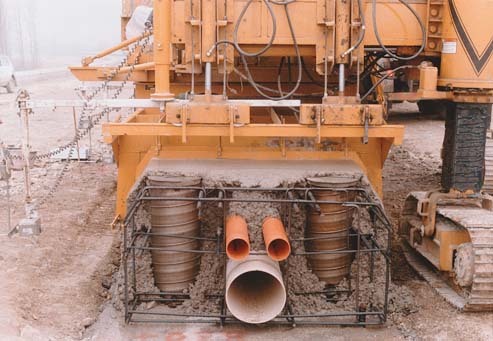 Beton Tecnica utilized the machine's versatility and capabilities in several unique applications. The quality of their end product in every project is a testimony to their talents and expertise. Select any photo for a closer look.